Renowned exhibition maker and Professor of Fashion and Museology at London College of Fashion, Judith Clark has paved the way for new approaches and perspectives in the field of fashion curation since establishing the Judith Clark Costume Gallery (1997, London). She has curated more than 40 fashion exhibitions at major museums and, through the MA Fashion Curation, at London College of Fashion, which she directs with Professor Amy de la Haye, she continues to inspire generations of students and future curators. Address contributor Flavia Loscialpo asked Judith to reflect on her career so far. Flavia Loscialpo: You are well known for your experimental curatorial practice, questioning ways of displaying and looking at objects. Exhibitions you have curated include Diana Vreeland After Diana Vreeland (Museo Fortuny, Venice, 2012), Simonetta: la Prima donna della moda italiana (Palazzo Pitti, Florence, 2008), Anna Piaggi: Fashion-ology (Victoria & Albert Museum, London, 2006), and Chloé. Attitudes (Palais de Tokyo, Paris, 2012; Selfridges, London, 2013). What is evident in all these is a listening to, and exploring of, an existing body of work or archive, which is then translated within the scenography. For instance, in Anna Piaggi: Fashion-ology, Piaggi’s interest in typography was incorporated into the installation. Within Chloé. 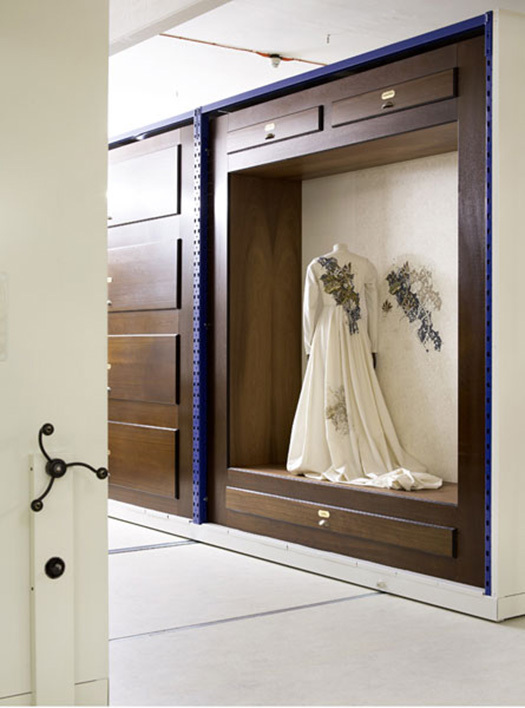 Attitudes, the pattern of a dress, which no longer survives, became a marquetry floor. In this way, the exhibition lets the viewers experience an archive in new ways, and at the same time the archive becomes alive. Can you guide us through your way/ways of experiencing and experimenting with an archive, or body of work/material, when designing an exhibition? Judith Clark: You have listed exactly those exhibitions where I have been commissioned, over the past few years, to create an exhibition from an existing archive and, as you say, it is then about creating a route for the visitor through that often huge body of work, rather than generating an idea that is then illustrated from multiple sources. What I try to resist is to single out the dresses too much from their context, however iconic they may be, and see what other aspects of the material seem to be imperative. Often I look at the archive first without taking any notes, so I go on impressions, what sticks in my mind, which pieces I feel for some reason could not be left out. I am very alert to quotation and what to do with it – I mean, if something has been borrowed as inspiration, sometimes it feels right to spring it. The floor you refer to in the Chloé. Attitudes exhibition in Paris is a good case in point. There was the image of tumbling blocks printed on a dress that no longer survives. Tumbling blocks is more typically used for floors, so by recreating it as a floor it drew the association – whether documented or not. The visitor is then within the aesthetic realm of the collection, perhaps in unconscious ways. With Anna Piaggi, I knew typography was such a passion of hers that it needed to be embedded within the exhibition as it was omnipresent in her Doppie Pagine collages for Vogue – as an exhibition-maker you have to decide: do you write a caption saying “Anna Piaggi loved typography” or do you build a cabinet shaped like an A? You are always making choices about how you are going to communicate the material – I like the ambiguity of creating an impression rather than stating a fact. FL: Your drawings of the installations, even the initial sketches, are often published in the books accompanying the exhibitions, thus disclosing an insight into the process leading to the final outcome. What role does sketching play in your practice as exhibition maker? JC: Sketching is fundamental to me. I rehearse the exhibition design over and over again and draw the garments over and over again as well. If I get the scale wrong, it is often very telling – like willing something to be more important. It is a left over from being an architecture student as well. I publish them simply with the reader in mind. I used to crave knowing more about the exhibition process that, as we all now know (and many are rectifying by republishing histories of past exhibitions), was almost non-existent. Not even installation shots. Now we can’t get enough of them. FL: Your curatorial practice and research pays particular attention to language and interpretation; this ‘care’ is in some cases particularly eloquent. For instance, in 2000 you curated at the Judith Clark Costume Gallery the exhibition Captions, which invited visitors to write captions for the gown exhibited, by Alexander McQueen. 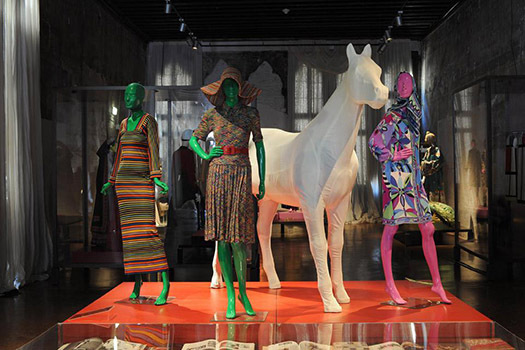 For the more recent The Concise Dictionary of Dress (Blythe House, London, 2010) you collaborated with psychoanalyst and writer Adam Phillips, who created a series of open definitions of dress terms that accompanied the installation. The objects participated in word-plays. Can you talk about this emphasis on language and interpretation in your work? JC: Captions was one of my favorite exhibitions and maybe my most experimental to date, even though so simple. It is incredible to me that I am accused of not liking them very much. What I am actually being accused of is seeming to be so fluid about them as though it is really about putting the ‘right‘ information on them. This is what I put in question with the McQueen couture dress, which was so dramatically eloquent. It was the perfect case study. It raised a timely question – I felt – about the re-description of fashion, as a more conceptual art form maybe, which now feels so outdated but, in 1999-2000, seemed still somewhat relevant. The Concise Dictionary of Dress staged a decade later could take all those questions for granted and move on to experimenting with the juxtaposition of ideas of definition and illustration around a word that had some sartorial relevance. I think it is interesting to look at the two exhibitions like this, as their contexts are so dramatically different. FL: An exhibition has per se a collaborative nature, as a whole team is involved. Exchanges, collaborations and commissions constitute a very important feature of your curatorial practice, and you have worked with designers such as Chalayan and Filmer, architects such as Yuri Avvakumov, and illustrators such as Ruben Toledo, just to mention some of them. You have written a book titled Exhibiting Fashion: Before and After 1971 with Professor Amy de la Haye on fashion curation for Yale University Press. Can you tell us more about the importance of collaboration and also possibly about the book you are co-writing? JC: It is important to me that exhibitions are not closed didactic systems. Collaborations clearly help, even if only through a sense of aesthetic variety, and drum that home: these are different ‘takes’. I have learned from these collaborations: from Filmer’s mannerist bodies, to Chalayan’s meticulous conceptual processes. Recently, the more I take on, design wise, as an exhibition-maker rather than curator, the more I have collaborated with craftspeople. We have started embedding this into the course at London College of Fashion – not only a second term unit that is entirely collaborative amongst the students, but also introducing sessions on props, for example. The book you refer to has been a long time coming. Amy de la Haye and I have compared notes for a long time now and we always felt that, whilst teaching, students clearly benefitted more from our differences than our similarities. We have written a re-description of an exhibition that was staged at the V&A in 1971 as a series of suggested histories and descriptions from our different points of view. FL: In the past years fashion curation, as an academic discipline, has been defining and consolidating itself, thanks to the contribution of yourself as well as of other key practitioners and academics. Nowadays, we can witness a proliferation of fashion exhibitions, which are attracting large audiences. From David Bowie Is (V&A, 2013) to Alexander McQueen: Savage Beauty (Metropolitan Museum of Art, NY, 2011); from Hollywood Costume (V&A, 2012-2013) to Tim Walker: Story Teller (Somerset House, London, 2012-2013), fashion related exhibitions are extremely popular. What do you think the future holds for the discipline and practice of curating fashion? JC: I experience it as freeing. It is a chance to articulate this discipline not as one unified voice but as various often incompatible ones. I think it is in everyone’s interest for there to be more debate. It is clear from the students that come to follow the Masters programme Amy de la Haye and I run at London College Fashion, they have a precise idea of what they want to be/do, which is incredibly varied compared to only a few years ago. The pendulum has swung from dress exhibitions as the underdog and underfunded, to huge crowd pullers and demographic “broadeners”. Hopefully this will settle somewhere in the middle so that outcomes are less pre-empted. FL: In your work, space and object are equally important. Even an exhibition that is purely hypothetical should start from a space, either existent or not. In recent years, an interesting debate has concentrated on the possibilities and challenges that online exhibitions disclose. Have you ever been interested in experimenting with a virtual space and curating an exhibition online? JC: I have been interested in this for many years, how could I not have been? I considered, when leaving my gallery, setting up a virtual version of it to keep it going and even had a heading on my website ready for it. I am now biding my time to see what might be of interest to me about it. I have also been absolutely preoccupied with the making of exhibitions, the craft of them, which still is the greater pull for me. At the moment, I still feel more likely to do a carpentry course than that of digital programmer but the two will soon converge, I am sure. My first exhibition really was a hypothetical one – with documentary director James Norton. It was a short film called ‘Satin Cages’ filmed from a miniature model exhibition of crinolines that I built. The venue was based on a hypothetical dome, imaged by Brodsky and Utkin, and “would have been” my ideal venue. Things like that interest me still – the link with architectural structures. This interview was first published in Address – journal for fashion criticism issue two.